I post, as you all will have surmised, when I have something to share, or say. It just sounded interesting. I had to explore. Trending items seem to be going toward the more delicate, minimalist, and refined. I’ve branched out beyond Etsy because I believe one should expand horizons and keep options open. To that end, I’ve made accounts at both DaWanda and Zibbet. I much prefer handstitching to other forms of needlework. It serves the dual purpose of occupying my mind and my hands and is therefore a creative therapy as well as producing something useful and hopefully lovely to look at. The economics of this is pretty obvious. Creative pursuits are easier when one has a touchstone for inspiration. 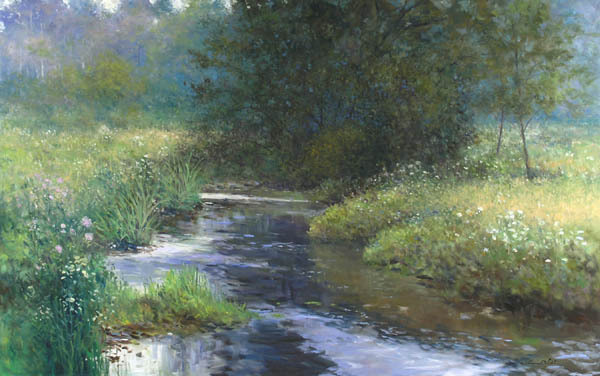 Mine has to do with rivulets, creeks, waterways hidden among verdant vegetation, which is why I incorporate willows and rivers into my online presence. These images help to calm turbulent thoughts and evoke a kind of quiet anarchy. There’s a duality at work, as nature knows no bounds, and this reminds me that as water travels over rocks, rough places eventually become smooth. This demonstrates that persistence and consistence result in desired change. And all work results in something transformative, even if we do not know exactly where it is leading, or how things will all turn out. But back to economics. In its purest sense, economics is the science of choice. It is also a science of change. As is creativity. Art is not the sole claimant here. Art and science are both involved. The synapses and neurons in my brain create and react to choices and direct my actions in creative pursuits. When we separate choice from action all that results is a mindless muddle. Creativity reveals the world behind our choices. We should strive to select those things that reflect meaning in our lives.